On Thursday, August 31, 2017 from 6:30-8:00 PM we have our fall recruiting event at Fall Creek Elementary, 12131 Olio Rd, Fishers, Indiana 46037. All scouts are encouraged to attend in their Class A uniforms. Feel free to bring Pinewood Derby cars and anything else that might excite recruits about scouting. 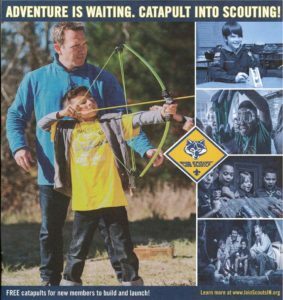 This year’s theme is Catapult into Scouting – all scouts and siblings in attendance will build a miniature catapult that they get to take home! Scouts are encouraged to wear their Class A uniforms to school on Thursday, August 31, 2017 and invite any friends who may be interested in joining scouts. Annual dues are $190 for new scouts and $150 for continuing scouts. The Pack is collecting an initial payment of $50 for registration and the remainder of the dues will be collected later in the year. Checks can be made out to Pack 122 and we can accept credit card payments as well. New recruits that are unable to attend the registration night event may join online. Welcome to the Pack 122 website. We are a Cub Scout Pack in Fishers, Indiana. We are in the Del-Mi District of the Crossroads of America Council of the Boy Scouts of America. Our pack serves Kindergarten through Fifth Grade and our scouts primarily attend Fall Creek Elementary School in Fishers, but all interested boys are welcome to join Pack 122.